In 1956 a diesel was purchased and the electricity for the overhead wire was shut off soon after its delivery October 31st 1956. Dwight Smith, Jr. the general manager at that time selected the paint scheam, black and white stripes, for maximum contrast visabilety and New York, New Haven & Hartford Orange to make it colorful. The GE 44 tonner was originally built in 1942 for the Pentaluma & Santa Rosa Railroad. It also saw service on a Western Pacific Railroad subsidiary, the Sacramento Northern Railroad. The locomotive, "number 1" was rebuilt by General Electric in 1956. Number One had to be sent to the B&M shops because of mechanical difficulties encountered while preparing to pick up its first string of freight cars. 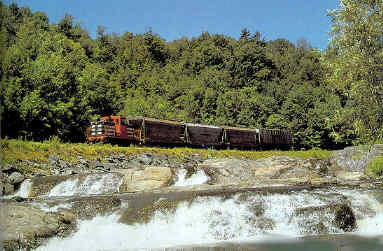 Springfield Terminal Railway was the first railroad in Vermont to carry tractor trailer, trailers on flat cars (Piggy Back Service). Mr. Smith had the piggyback facility built with the poles from the retired overhead system. Trains Magazine , Rail Age and Traffic World were on hand for the first piggy back operations. Thanks to Dwight A. Smith, Jr.'s careful management and his employees cooperation, Springfield Terminal Railway Corporation survived through some hard times 1956 to 1959. He even filled in for his train crew so that they could have thier vacations. He is an avid rail fan, and it was hard for him to make the decision to take down the wires. Mr. Smith also went on to work the B&M sales department in Portland Maine. He since moved on to work with Conway Scenic Railroad. Click here to view a map of the railroad. This Map Appeared in The Railroad Enthusiast, Summer and Autumn 1969. on page 4. It shows the Springfield Terminal Railway's route as of 1955. In 1966, route 11 was relocated and widened. This meant that the rails were also relocated. The line was discontinued in 1984. In the 80's most of the freight was hauled by diesel locomotives leased from the B&M. Number 1, was having maintenance problems and was sent back to the B&M shops for repairs one too many times and appeared over on the Clairmont & Concord where it was to be used for parts. For a number of years STRyC #1 was setting over at Clairmont Junction, New Hampshire, parts removed for use in Clairmont & Concord's numerous GE 44 tonners, glass broken out and rusting. Diesel locomotive Number 1 was cut up and sold for scrap during September 1997. Information on Clarmont Electric Railway and Clarmont & Concord, will be posted for June 2000. The orange text below are links to other sources of related information. Click on the orange text to connect to related sites. It should also be noted that much of the electric powered equipment sold during dieselization, is still around today. 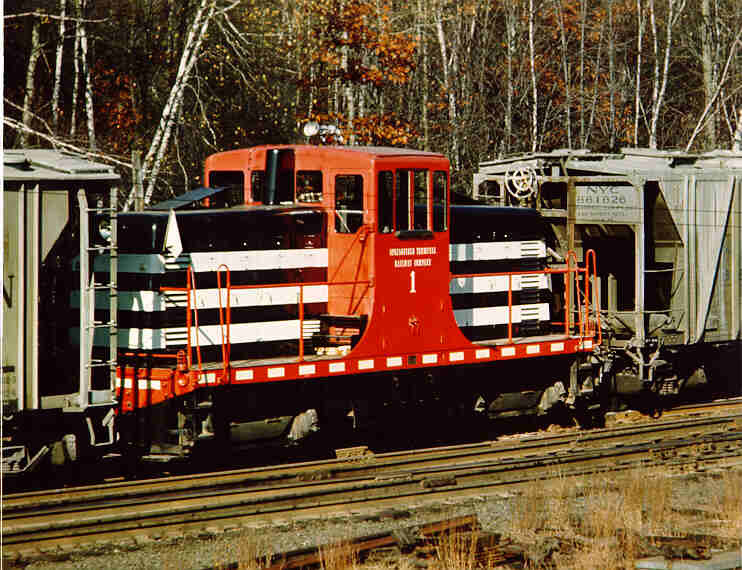 Line Car Number 8, Double-Ended Plow Number 12 and Combine Number 16 are at Warehouse Point, in Connecticut. Car Number 16 in the collection of The Connecticut Trolley Museum . The snowplow Number 12 awaits restoration and Work car Number 8 has rotted away, leaving just the trucks in the museums collection. Freight Motor number 20, was sold to Cornwall Street Railway & Light Company and renumbered as 14. Freight Motor Number 15 was also sold to Cornwall Street Railway. It was renumbered as 7. You can see them in the equipment roster for the Cornwall Street Railway Light & Power Company. STRC Number 20, CSRLP 14 is now in the collection of the Illinois Railway Museum. the general manager of Springfield Terminal Railway Company from 1956 to 1959. Railroads of Vermont Vol. II, Robert C. Jones. Shelburne, VT : New England Press 1993. Railroads of the Connecticut River Valley, Vol. VIII,by R. Nimke. Rutland, VT : Sharp Offset Printing 1993. I ran New Englands Last Country Trolley Line , The Railroad Enthusiast, Summer and Autumn 1969, Traction Issue , Dwight A. Smith Jr., Railroad Enthusiasts, Inc. 1969. E-mail messages to and from Museums and Internet users. Photo 1 from "Bob's Photos". Photo 2 from Green Mountain Rails, by Robert W. Jones. Springfield Electric - A Map of the Railroad - Table of Contents - e-mail - Springfield Electric / Terminal Equipment Roster - the interchange .